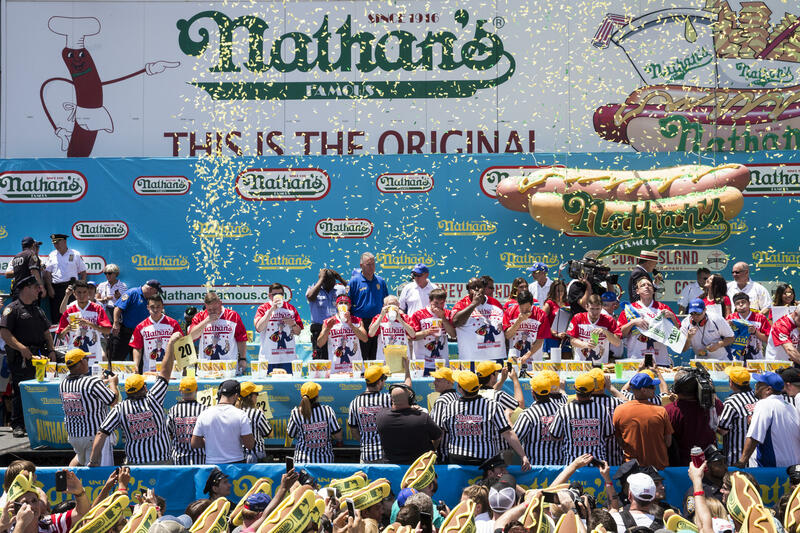 The Nathan's Famous Hot Dog Eating Contest is an annual competitive eating event held every Fourth of July at the company's iconic Coney Island location. It's a tradition that draws thousands of people to watch competitors wolf down hot dogs on an elevated stage along the boardwalk. On Wednesday, Joey "Jaws" Chestnut ate a record 74 hot dogs and buns for his 11th victory at the event. Miki Sudo won her fifth consecutive title in the women's competition. What is Nathan's Famous Hot Dog Eating Contest? The annual international competition is sanctioned by Major League Eating. But prior to competing, competitors in both men's and women's divisions must first qualify in one of many regional events held across the country. The first contest was held in 1972, when the winner scarfed down just 14 dogs. During the competition, contestants vie for a $40,000 prize by eating as many hot dogs -- buns included -- as they can in 10 minutes. There are judges and rules that guide tiebreakers and violations. Last year, Joey "Jaws" Chestnut repeated as men's champion by eating 72 hot dogs, beating the records he previously set in 2013 and 2016. His win last year was his 10th victory at the annual Nathan's Famous competition.